Mitti Ke Rang | Travel experiences of my life which make me believe that "life is beautiful"
Suyash Dixit, Indian explorer and CEO of Softinator. Never knew his passion for travel will one day make him the King. Bir Tawil, 2,060 sq km land which exists between Sudan and Egypt was not claimed by any recognised government, is now proclaimed by Suyash Dixit. On one of his Facebook post Suyash said “I, Suyash Dixit, first of my name and the protector of the realm, declare myself as the king of “Kingdom of Dixit”. I call myself, King Suyash First from today. I declare this unclaimed land of Bir Tawil as my country from now to the eternity of time,”. He planned for many days and took the most optimised route where he could take the car and paid a local driver to take him to Bir Tawil. The route falls under Egyptian military and requires permission as it is an international border. Due to high terrorist activities, the military has a shoot at sight order. He was allowed entry into the area on three conditions, no photos of military areas (which is almost everything), to be back in the single day and not to carry any valuables. Approximately 60 km from the city of Bengaluru, close to the Bangalore International Airport, in the Chikkaballapur district, there lies an ancient hill fortress Nandi Hills also known as Nandidurg or Nandi Betta. Situated at a height of 1,480 meters above the sea level, the hill is known for once being a Tipu Sultan’s Summer Palace. Blessed with a pleasant climate and picturesque location featuring the misty mountains and the brilliant sunrise, it has become a quite popular weekend outing spot for the Bangaloreans. Nandi Hills is a popular summer resort as temperatures hover around 25 degrees here during this period. During winter, the temperatures drop down to as low as 5 degrees. Best time to reach there is before sunrise. The sun rises at around 5:30 am during summers, and it is truly a magical sight to watch. The wind, fog, and clouds that blow towards you in the morning is just amazing. To enjoy the sunrise at this beautiful location, you need to start early morning (around 4:00-4:30 AM) from Bengaluru. This 60 km journey takes you past a picturesque route. The hills are located about 20 km from the National Highway (NH-7) just after Devanahalli Town. 10km after passing by BIAL airport flyover, as you take a left diversion from NH 7 and turn towards Nandi hill road, you start feeling a sudden change in landscape and also climate. As you start climbing the hill, the road turns curvy with few sharp hairpin bends along steep slopes adorned with pictorial farms and hamlets. On the way, you can see many folks cycling all the way to the top. Nandi Hills is cyclists paradise, around 400 meters of altitude gain in 7 km of the ride, The bikers/cyclists from Bangalore storm there on weekends and holidays. It’s a very good hill training spot for them. The region around Nandi Hills is also known for its Vineyards. You can give a short visit to those grape orchards while returning and even buy fresh grapes from small girls selling them on the road sides. While Nandi Hills hosts many temples built by the Cholas, its prominence gained multifold when Tipu Sultan built his Summer Palace at the site. The palace is protected by the Karnataka State government and is a major tourist attraction now. Sprawling over an area of 90 acres, this beautiful palace has engraved walls and ceilings. You need to take an entry ticket of 10 Rs at the base of the fortress.In addition to this, a parking fee of Rs 100 is levied for cars and Rs 20 for two-wheelers. From there you have to climb 1,175 steps to reach the top of the hill. The steps leading from the fort entrance to the summit are surrounded by vegetation that forms the ideal habitat for various species of wintering thrushes and warblers. Tipu’s Drop – the famous place from where Tippu Sultan had his condemned prisoners thrown to death. Tipu’s Summer Palace and Fort – During the Ganga period, the Chikkaballapur Chieftains built a fort. Tippu strengthened it further and also built a rest house. This used to be Tippu’s summer bungalow. It is not open to the general public. Horse Way – A stone doorway in the fort on the North-eastern side, is believed to have been the horse way for helping soldiers to climb the wall on horseback. Secret Escape Route – A secret passage on the west, is believed to have helped the Kings to escape during unforeseen attacks. Temples – there are temples dedicated to Sri Bhoga Narasimha, Sri Ugra Narasimha and Sri Yoga Narasimha and you can see beautiful old temples. Gavi Veerbhadra Swamy temple: on top of the hill, on the way to the Sultanpet, from Tippu’s palace, a natural formation of huge boulders have been transformed into a magnificent temple. Nehru Nilaya – where Jawaharlal Nehru used to stay, now a guest house of the horticulture department of India. Rivers – the rivers Pennar, Palar and Arkavati originate from these hills. Most of the sources have dried up. Amruth Sarovar is a beautiful water lake that brims with lucid water all the year round. Bangalore is only 60 km from Nandi Hills, If you are planning to visit Nandi Hills, You can give a short visit to Bangalore also. You can use trip planner app VisitIn which will help you to find the shortest sequence to visit top tourist places of Bangalore. Ever visited a hill station? Now, you must be thinking what a silly question it is… hill stations are basically the first choice of every travel enthusiast. But the point in my question were you just mesmerized with the beauty of the nature, those huge mountains covered in the sheets of snow and those beautiful curvy roads covered with greenery all over or did you also had a look at the culture, the tradition and the spirituality over there, only a few would have. India is recognised as the land of culture, customs and traditions, and each place in India has its own dose of culture, customs and traditions, served in the euphoric way possible. Visiting any new place strikes something beautiful and new into you, and some places are even beneficial in uplifting you mentally, physically and emotionally by helping you fight with your stress in a blissful manner. Leh -Ladakh, Sikkim, Manali, Shimla and almost every hill station of India are places which are the house to a beautiful and mesmerising view which is enough to make the tourists fall head over heels in love with the place. But do you know these places are a home to Buddhism and a strict meditation and discipline? Buddhism is known to be the building block of discipline and meditation, monks and nuns of all ages work together in order to teach people the benefits and the importance of meditation in this stress trapped life. People are busy with their lives being left with no time to look after themselves which further leads to a lot of diseases and problems. However, it is believed that meditation is the core solution to all of your problems and diseases, meditation offers you a soothing comfort relaxing you mentally, emotionally and physically. These hill stations are not only a home to meditation but they also proffer a wide range of ayurvedic medicines which are known for being a perfect natural remedy to all health concerns. If unable to get these ayurvedic medicines easily or are allergic to them then, you can buy ayurvedic supplements online that strive to provide the same results. So, the next time you visit any of the hill station don’t just get dazzled by the beauty of nature but also visit a monastery, spend a little time with the monks and nuns over there, getting a closer tip-off about their lifestyle, their discipline and the meditation level, and do copy a bit of their lifestyle in your daily routine in order to have a perfect, stress free life. Muskaan is a content writer presently working with NaturesBuggy LLP, an online platform profusely dealing in supplements and gardening. Following her interest towards writing and an aim of making this stressed captured the unhealthy world, better and healthier Muskaan chose to start blogging about health & fitness articles additionally covering gardening topics to make the world more concerned about their health and greenery around them. 3 days in Munnar – I fell in love with this place! Since childhood, I always wondered what is so special about Kerala (a state in southwest India) that it is being referred to God’s own country. Though I travelled a lot in India, somehow my plans to visit Kerala could not get materialized until this summer when I with my husband and my parents finally set foot in Munnar-breathtakingly beautiful – a haven of peace and tranquillity – the idyllic tourist destination in God’s own country. Munnar is a town and hill station located in the Idukki district of the southwestern Indian state of Kerala. It is situated at around 1,600 meters (5,200 ft) above mean sea level, in the Western Ghats range of mountains and is well known for its unending expanse of tea plantations, pristine valleys, majestic mountains and exotic species of flora and fauna in its wild sanctuaries and forests. Top tourist places in Munnar are – Forest Flower Garden, Photo Point, Mattupatty Dam, Echo Point, Kundala Lake, Top Station viewpoint, Pothamedu Viewpoint, Athukadu waterfalls, karadipara viewpoint, spice garden, kallar waterfalls, Lakkam Waterfalls, Thoovanam waterfalls, Hydel Park, Tea Museum, Eravikulam National Park, ChinnarWildlife Sanctuary; these are the must visit places in Munnar, I used VisitIn App to find the best and shortest sequence to visit all these places, which significantly saved my time. It was a 3 day trip from Bengaluru. Distance from Bengaluru to Munnar is approx 450 km via Udumalpet – Munnar Rd. On Friday night at 10:00 PM, we started from Bengaluru via Royal Travels AC sleeper bus and it was quite comfortable. It took around 12 hours to reach Munnar. We reached around 10 in the morning at Munnar bus stand. Auto and cabs are easily available from here. If you want you can also book them for a sightseeing tour of Munnar. We had already booked our hotel “GreenSpaces B&B” through booking.com. We checked the distance on Google maps and it was showing just 4 km from there but when we confirmed it with few auto drivers they told us it is around 10 km from here. They were right as our hotel was quite far from the main town, situated inside the forest area of Devikulam, a panoramic hillside near Munnar, google map was not able to show the complete route till the hotel. In Munnar instead of depending on Google maps, you can trust local cab drivers. They are quite honest and charge genuinely. It was a cloudy day, the mist had covered the mountain peaks.We could feel the cool misty breeze on our faces. Our resort was 6 km inside from main Pallivasal Road. As we took a cut from the main road towards the hotel, the road became very narrow, covered with lush green forests from both the sides. There were very few homestay and resorts on the way. It was a perfect area for those, who want the peaceful location to stay, in a completely natural surroundings away from the town. Riding up and down on mountainous jungle trails, as we reached the hotel we were amazed to see this nature-themed accommodation. It was a beautiful small place comprising of only 5 rooms, in the middle of cardamon plantation. The walls and roofs were completely covered with creepers, it was like a hidden cottage of some fairy tale. The wooden decor of the room was giving off the natural vibe. As we opened the balcony doors, the cool misty breeze filled our room. We had an ultimate experience of living in the forest, in the close proximity to nature, so peaceful and wild. After getting ready we started for sightseeing tour of the town.We booked the cab for sightseeing tour for 3 days in 4000 Rs from the same person who drove us to our hotel in the morning. There are lots of tourist attractions in Munnar and they are scattered in 4 different directions – Mattupetty direction, Coimbatore direction, Cochin direction and Thekkady Direction. You require at least 1 day for each direction. On the first day as we had less time to travel, we started for Cochin direction as it could be easily covered in 5-6 hours. On our way, At first, we stopped at Pothamedu View Point which offers a good view of the valley, though not the best. What makes it perfect is a glass of masala tea from a tea stall just in front of the viewpoint. Next, we stopped to get the view of Athukadu waterfalls from a distance as our driver told us that due to some accidental slipping of some foreigner in the fall last year, the trekking to the waterfall is not permitted. Next, we halted for some refreshment at Karadippara viewpoint. The view from this point at Karadipara was simply awesome, you could see the vast and sprawling mountain as far as gaze can go and it was a nice perch to get some great photographs. After enjoying the beautiful view with dosa and a cup of tea, we headed towards Kallar waterfalls. It was a medium height fall located in a dense forest area. We had to walk almost half km to reach here, it was more like a small trekking. After having some fun in cold and fresh water of the fall we moved ahead for Spice Garden visit at Kerala Farm. There was an entry fee of 100 rupees which include a short jeep ride down to the farm (you could walk down to the farm if you wanted to) and a guided tour. It was quite exciting to see the various spices plants like Black Pepper, cloves, cardamom and other medicinal plants like Brahmi, Sathavari, Neela Amari, Insulin etc. Our guide also explained about traditional and medicinal uses of all the plants. It was a beautiful farm to walk around. After the tour of the garden, you are taken to the shop where you can purchase the products that you have just learnt about. The products are expensive, do not feel compelled to buy so many products as it will cost you huge. You can get all those products everywhere in Kerala. Overall the visit was good and knowledgeable. After this we reached the last spot of our day1 trip- Hydel Park which is about 3 km away from Munnar town, is situated towards the old Munnar nearby the banks of River Muthirappuzha and the misty Kannan Devan Hill Tea Estates.It had a vast stretch of landscaped mounts, gardens, artificial waterfalls & lawns, that offer a wide range of facilities to make visitors feel relaxed and rejuvenated. You can also enjoy fish spa there. On next day we got ready early and started for Mattupetty Direction. Many of the most beautiful spots of Munnar are in this direction. Main attractions include Flower Garden, Photo Point, Jungle Honey Bee Nest, Elephant Ride at Carmelagiri Elephant Park, Botanical Garden, Mattupetty Dam, Echo Point, Tribal village view, Kundala Lake, Vegetable Farm and Top Station viewpoint. Flower Garden: It is a beautiful garden with hundreds of rare varieties of flowers and herbal plants with large tea plantations in the background. Jungle Honey Bee Nest– Honey Bee Nest is located at 4 Km away from Munnar on the way to Mattupetty. You can see around 20-25 honeybee nest occupied in a single tree. Carmelagiri Elephant Park- It offers a ride on the back of an elephant through the rugged terrain and deep valleys of the Misty Munnar forests. The ticket for per person is 400 Rs for 45 min ride. As we were short of time so we skipped it. Mattupetty Dam– Located 13 km away from Munnar the dam of Mattupetty is a storage concrete gravity dam constructed in late 1940. It is a vital source of electricity generation in Munnar and also a haven for many wild animals and birds due to its constant water availability.The most attractive part of Mattupetty dam is its still water which reflects the tea garden around. You can also enjoy water sports activities like speed boating organized by District Tourism Promotion Council of Idukki (Munnar) or do the horse riding in the pretty natural surroundings of this beautiful dam. Mattupetty Indo-Swiss Farm- on the way to Mattupatty dam, It is the dairy farm, run by the Indo-Swiss Livestock Project for the development of new high-quality cattle breed suitable for Indian environment. The Tourists are allowed to visit the farm with an entry fee of Rs. 5 per head from 9 am to 11 and 2 pm to 3.30 pm. It was not included in our itinerary but we could see plenty of those cattle grazing in the pastures on both sides of the roads. Echo Point- Situated on the way to Top Station from Munnar, this scenic place gets its name from the natural echo phenomenon here. Kundala Dam – Located approximately 20 km from Munnar on the way to Top Station, Kundala Dam is Asia’s first Arch Dam. The picturesque Kundala lake is surrounded by green valleys and majestic landscapes.The boating experience at this dam is a wonderful experience beyond words. Boating facilities namely pedal boats, Kashmiri shikhara boats, and row boats are available on rent to make your trip more enjoyable. Top Station- Situated 32 km from Munnar, the highest point (1700m) on the Munnar-Kodaikanal road, Top Station offers a panoramic view of the majestic Western Ghats. The rare Neelakurinji (Strobilanthus), for which the destination is popular, blooms once in twelve years. While returning we got down 1 km before our resort and decided to walk to the resort.While walking on ups and downs on mountain slopes with eucalyptus and oak tree forests on both sides, Fresh air filled with the aroma of spices was so refreshing. It rejuvenated us completely. Half km from our resort there was tea plantation. We went to the top of the slopes of the plantation, from there we could see thick forest down the slopes, and heard some voices of wild animals. As time passed, more and more clouds started coming and covered the forest completely. We got down fast and rushed towards the hotel so that we can reach the hotel before darkness as the path leading from there to our hotel passes through forest and there were no street lights on the way. It becomes completely dark as night falls. Only the resort street had some lights. The views from those streets were better than any of the sightseeing destinations. we enjoyed that wilderness near our resort. It was the last day of our trip, we had our bus at 4 o’clock in the evening for Bengaluru. We had half day to visit, we decided to go for Eravikulam National Park, a sanctuary for the endangered mountain goat of South India, the Nilgiri Tahr. We checked out from the hotel in the morning and left for National Park. 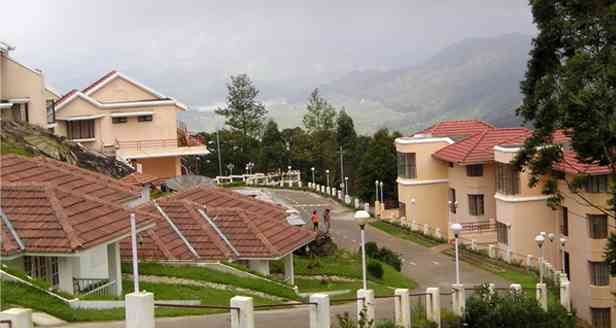 It is the most sought after destination in Munnar and lies 10 km away in Coimbatore direction from Munnar bus stand. It is UNESCO World Heritage Site.The sanctuary is divided into three regions – the core area, the buffer area and the tourism area. Visitors are allowed only to the tourism area – Rajamalai – the region lying beyond the road entry into Eravikulam. Our cab driver left us outside the Rajamalai as Private vehicles are not allowed inside. From there we were taken in forest dept mini buses to 4 KM long hill. As there is a huge rush, you need to wait in ques to get into the bus. Avoid going on weekends. We went on Monday still we had to wait for 45 minutes but the wait was worth.That Bus ride was charismatic experience offering a magnificent view of the tea plantations and rolling hill plateau caressed by blankets of mist. The terrain was completely covered with grasslands interspersed with shola forests.Many perennial streams criss-cross the park. After 4 km ride, the bus dropped at a point from where we could walk 1 Km inside the park. In this 1 km walk, we got to see many Nilgiri Tahrs from very close quarters. From here you also get a mesmerizing view of Anamudi, the highest peak (2695 m) south of Himalayas, standing majestically in the core area of the national park. The park becomes a hot destination when the hill slopes get covered in a carpet of blue, resulting from the flowering of Neelakurinji. It is a plant endemic to this part of the Western Ghats which blooms once in twelve years. In 2018 it is going to bloom again :). We hope to visit again next year. This was by far the best place to see in Munnar. We returned from there around 2 o’clock. Still, we had 2 hours left. So we decided to visit the C.S.I Christ Church, an old British era stone church on the way to bus stand. Standing in a tranquil location, it had charming interiors which still retained stained-glass windows, brass plaques, rows of rosewood pews and an ornate chandelier. After this short visit to the church, we went for some shopping in the town like famous Munnar Tea, spices, essential oils, and some wooden handicrafts. At 3:45 we reached the bus stand and boarded our bus SRS travels. The bus route was very scenic. As the bus crosses through Chinnar wildlife area it offers a beautiful view of dense forest valleys and rivers passing through it. Now I know the beauty of Kerala and its forest is incomparable and it is truly God’s own country. The Bhupen Hazarika Setu (Dhola–Sadiya Bridge) the longest bridge in India is 9.15 KM in length.The Bridge has been named after Bhupen Hazarika, a famous musician, poet and lyricist from Assam. The project cost around 10.00 billion rupees and took around 5 years to complete. It is 3.5 KM longer than the Bandra-Worli Sea Link in Mumbai. The bridge is engineered to withstand earthquakes and the weight of 60-tonne battle tanks. The bridge will prove to be a significant link between Arunachal & Assam. The Maldives is a beautiful South Asian island country. It’s a group of 1200 islands lying southwest of India and Sri Lanka, out of which only 200 are inhabited by local Maldivian people, nearly 100 islands have been developed as tourist resorts and the remaining islands are uninhabited. Maldives is called as “the tropical paradise” for its snowy white sandy beaches, turquoise blue lagoons, and its vast marine diversity. It was going to be my first foreign vacation with my husband, I was so happy and excited. After doing some research on the internet, we found that it would be more economical and customizable to plan our trip yourself rather than opting some travel packages. We booked our flight tickets via Srilankan airlines that cost us around 36000 INR for two of us for round trip from Bengaluru to Male (capital of Maldives). Then came the most important task of selecting a good hotel. With the help of booking.com, we booked a Beach facing Bungalow in Paradise Island Resort for 3 nights/4 days. It cost us around 50,000 INR (including taxes, breakfast, and dinner) that you need not pay at the time of booking. For Maldives, a pre-arrival visa is not required, regardless of your country of origin, provided you have a valid passport, proof of onward travel, and the money to be self-sufficient while in the country. Finally, the day came when we landed in Male, there were counters of different resorts on the airport. We reached our resort counter and waited there for 10-15 minutes for other tourists to assemble there. From there we headed towards the speedboat jetty which is only a 1-minute walk from the arrival terminal, view of the vast blue ocean was overwhelming. The speedboat was waiting there to take us to our destination. It charges around 7000 INR per person(return journey). Although very costly but it was an exciting and exotic 20-minute ride. From the glass window, you could get a beautiful view of the ocean, flying fishes and other gorgeous islands on the way. As we reached our island, it was a whole new world to embrace us. It was so beautiful, clean and calm. Island was surrounded by the turquoise blue water lagoon. A wooden bridge over the lagoon was connecting the jetty to the island. Water was so crystal clear that we could see, down the bridge, fishes swimming freely in the warm water. On the other end of the bridge was the resort’s private white sand beach lined with lush green palm and coconut trees. We were welcomed with a mint drink and generous smile. We did not know that a big surprise was waiting for us. We came to know that our beach bungalow was upgraded to haven suite, a villa built on stilts directly above the water, within the exclusive Haven complex as a gift from the resort. Its cost was around 80,000 for one night. You can imagine our joy :). As we reached to our heaven suite, we were stunned by its exotic location, the sweeping ocean views from its backyard, and a host of superb luxuries inside. We could not think a better place to relax and rejuvenate than this. It was a perfect heaven. Starting the day with a cup of coffee over the sea with the music of ocean waves, Getting down the stairs and take a dip in the refreshing salty water of Indian ocean, pampering yourself in your personal swimming pool just above the salty water of the ocean, taking sun bath in our private space in clear mornings, having a sumptuous meal in breakfast at lagoon restaurant, cycling on wooden planks above the water, enjoying the shark feeding in evening with lavish dinner after that and ending the day with happening live shows, cultural events in the bar. On one side, where Maldives is an ideal place to relax in a peaceful serene atmosphere, it also offers a lot to satiate your adventurous spirits. An array of watersports activities and facilities are there to indulge in like kayaking, Catamaran Sailing, Water Skiing, Jet Skiing, Parasailing, Windsurfing, Snorkelling etc. We have gone for kayaking and snorkeling lesson. Paddling your boat yourself and driving it in the mid of marvelous water of blue ocean was a great feeling. But Snorkeling lesson was something extraordinary. Being a non-swimmers, covering huge distance swaying in the ocean with a life jacket, masks, and fins and exploring the hidden secrets of the underwater world was a great thrill. Its big thanks to highly efficient management, polite and cordial staff of Paradise Island Resort and to the beautiful people of Maldives for giving us wonderful moments of our life to cherish forever. I can happily say… I LOVE MALDIVES. Plan your trip by yourself instead of going for tour packages as it will definitely save some bucks for you. All of the transactions are mostly in USD, so have your currency exchange done before reaching there as exchange rate would be quite higher there. Most of the hotels/resorts will offer complimentary breakfast. If you want to save some bucks in food, you can include half board(breakfast + dinner) in your itinerary as food are too expensive there. Most of the resorts have a mandatory transfer from the airport via speedboat or seaplane for which you need to pay additional charges(approx 100 USD per person) to the resort. So plan your budget accordingly. Do not forget sunscreen above 20 SPF (recommended). Do not miss the chance to enjoy a cup of the Sri Lankan Cylon tea. Close your eyes and imagine yourself riding a bicycle on peaceful, clean and well-laid streets lined with flowering trees, mustard yellow, grey and white color houses of colonial style with big compound walls and stately wooden doors, flamboyant bougainvillea bursting over gates, french style cafes and restaurants serving delicious authentic French cuisine- Welcome to Pondicherry also known as Puducherry, a french colonial settlement in India until 1954, now a union territory bounded by Tamil Nadu state. If you are planning for a small relaxing holiday, away from the crowded city life, Pondicherry is an ideal destination for you. From yoga and meditation to cycling on beautiful lanes to have some feel of old European town or just sitting by the beach, there are numerous ways to unwind in Pondicherry. Last year I visited this colonial city with my husband on our wedding anniversary, and we both eventually fell in love with the place, it’s beautiful architecture, palm-fringed beaches, quaint indo-french cafes and it’s appealing spiritual and cultural atmosphere. We stayed there at Shenbagga hotel, located in the main city and very close to the beach. The hotel had a swimming pool at the terrace of the hotel and the view of the sea from the hotel terrace was so beautiful. The hotel was quite close to all the prominent places like Aurobindo ashram, shopping street, Promenade etc. We took a bike on rent for two days which is easily available in the city and started exploring the enchanting beauty of this unique city. There are many beautiful old French-era churches in Pondicherry. Most famous are Notre Dame des Anges , Basilica of the Sacred Heart of Jesus and Our Lady of Immaculate Conception cathedral. We visited the last one, it is 300 years old church with splendid architecture (in whites and yellows) and one of the oldest tourist sites in Puducherry. This 1.2-kilometer-long stretch beach front is the most popular area of Pondicherry, especially at night. You will be amazed to see the lively atmosphere here every evening. The interesting thing is vehicles are not allowed after 6:00 PM. Park your vehicle in nearby parking stand and take a walk on this lively street enjoying the cool see breeze, watching magnificent landmarks like the War Memorial, statue of Joan of Arc, statue of Mahatma Gandhi and the heritage town hall situated on it. Some of the best restaurants of Pondicherry majorly dealing with traditional cuisine and seafood can be found here. Hawkers selling out local street food and handicrafts are a common sight near the beach. Founded in 1968 by Mirra Alfassa (known as “the Mother”), Auroville is a universal township developed on 20 square kilometers of barren wasteland, some 10 km north of Pondicherry , where people from different countries live in peace and progressive harmony above all creeds, all politics and all nationalities to realize human unity. In the middle of the town is the Matrimandir, lotus-shaped dome almost 30 meters high and is covered by golden discs that reflect sunlight. It is a meditation center. If you want to do meditation inside this peaceful area, a prior booking is required for ongoing meditation session. But to have a look at this magnificent structure of peace and tranquility from outside is also a treat to eyes. There are four popular beaches around Pondicherry: the Promenade, Serenity Beach, Auroville Beach and Paradise Beach. It was the abode of Sri Aurobindo and the Mother during most of their stay in Puducherry. In the inner courtyard is the Samadhi of Sri Aurobindo and the Mother. Ashram is a very peaceful small home amidst a pretty little garden. It is an important destination for spiritual seekers as well as tourists. Thousands of visitors from all over the world come to the ashram. If you are in Pondichery, do not forget to have dinner in some French restaurant/cafe. There are many such good restaurants in promenade area which serves authentic french cuisine. Hotel duParc where we had our dinner is one such cafe with beautiful open courtyard gardens. Having dinner in such beautiful place with a glass of wine is a perfect dinner to cherish. Pondicherry is a shopper’s delight offering wide range of products – from traditional handicrafts and attire to bags, accessories, ceramics and more at a very cheap price. Serenity Beach Bazaar,Mission Street are best for street shopping. It would be good to rent a bike(Rs 200 -400 /day) so that you can visit all the places easily. Try sea food and French restaurants. Have a dinner and walk at Beach Road. Find shortest route using Visitin. It will show you the best route to visit all tourist places in Pondicherry from your hotel/place of stay and strictly follow the route so that you can utilize your time in best possible way. If you are planning for meditation at Auroville, do prior booking for upcoming session. Travel experiences of my life which make me believe that "life is beautiful"